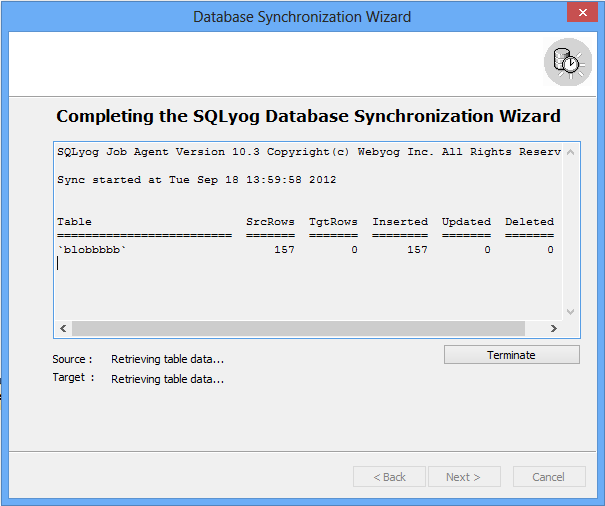 Selecting Synchronize Now… in the dialog shown above will start the synchronizing process. SQLyog starts up SJA as a child process to sync the databases. The complete detail of the sync process is shown in the last step of the wizard. 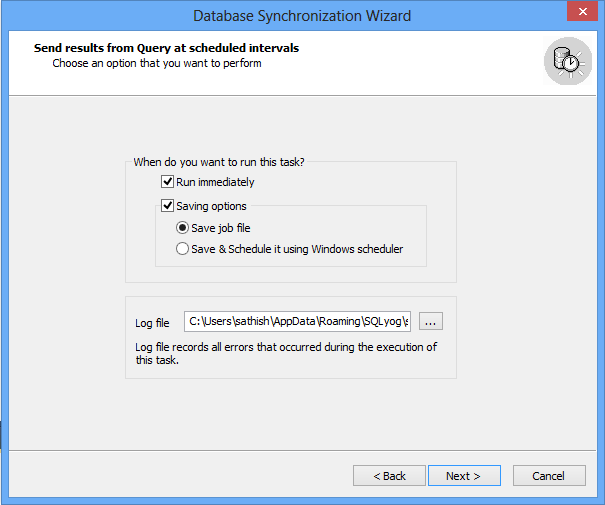 Check the option Run Immediately if you need your synchronization task to be executed at once. Check the option Saving Options if you need to use the task repeatedly. Select Save Job File if in the future you suppose to run the task manually (for this select the option Edit a saved Synchronization Session at the Wizard's first page or use the Job File as a command line argument for SJA.exe). With this option, at the following page of the Wizard you should indicate the name for the Job File which will be saved in the XML format. Select Save & Schedule It using Windows Scheduler if in the future you need the task to be launched automatically according to a certain schedule. In this case at the following page of the Wizard you should indicate the name for the Job File which will be saved in the XML format and the name for a MS Windows Schedule which will be automatically created for you by SQLyog as soon as the task is saved. The task properties window will appear and you will be able to schedule it as necessary. In the box at the bottom of the window, specify folder path where the SQLyog Log file must be saved. Here is the results page that will appear in the Wizard if you select the Run Immediately option.